What: Occupy Wall Street and its allies in the organized labor and immigrant rights movements are excited to announce that on May 1st, Tom Morello, Dan Deacon, Immortal Technique, Das Racist, Bobby Sanabria and other special guests yet to be announced will be performing on stage at the May Day rally in Union Square, Manhattan. 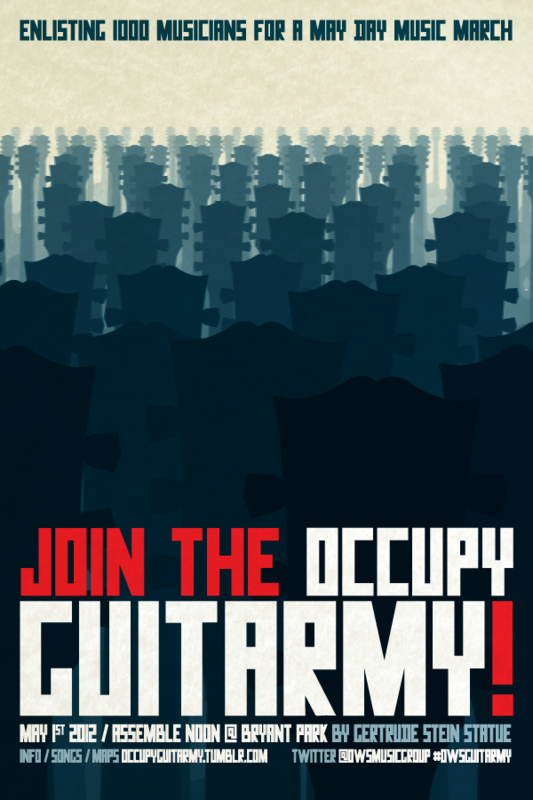 At 12pm, Tom Morello will arrive at Bryant Park to enlist 1,000 guitarists, string players, and singers to take part in the Occupy Guitarmy. After a rehearsal of Woody Guthrie’s “This Land Is Your Land,” Sergio Ortega’s “El Pueblo Unido,” Willie Nile’s “One Guitar,” The Nightwatchman’s “World Wild Rebel Song,” and the traditional spiritual “We Shall Not Be Moved,” the Occupy Guitarmy will depart from Bryant Park at 2pm, march through midtown Manhattan and arrive at Union Square at 4pm, culminating in their performance on stage with Tom Morello. Dan Deacon, Immortal Technique, Das Racist, Bobby Sanabria and other special guests yet to be announced will take the stage after Tom Morello’s set. On May Day, International Workers’ Day, the 99% will take to the streets and reclaim our communities. We’ll demand economic justice from the major institutions of government and industry who refuse to step forward and deliver a just society. No Work, No School, No Shopping, No Housework, No Compliance. May Day will be another important step forward in the growth of a resistance movement which has captured international headlines and countless imaginations since the occupation of Liberty Square on September 17th, 2011. 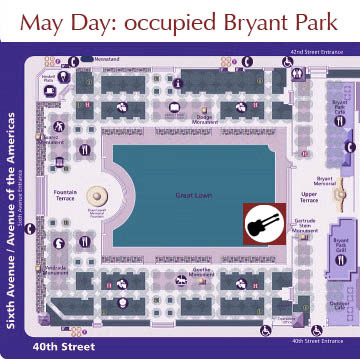 The May Day Occupy Guitarmy will meet by the Gertrude Stein statue in Occupied Bryant Park from 12pm. Get their early to learn songs, take a lesson, or hear talks by music and social justice teachers! "Labor and immigrants rights ALLIES!" Those words, and especially the word "ALLIES" are music to my ears! Can you say the word WIN?! !